Continuing from yesterday’s list of safe Democratic seats in the House of Delegates, today’s post looks at safe Republican seats. All were carried by Trump in 2016 and Hogan in 2014. At 31% of the House, the 44 safe seats fall well short of being able to sustain a veto by a Republican governor. As with the Democrats, Republicans dominate certain regions of the state to their electoral benefit. They have nine safe seats in Western Maryland, a region with Republican loyalties dating back to the Civil War, like in much of Appalachia. One delegate district (1A) centered on Garrett is arguably the safest GOP turf in the state. Portions of Allegany and Washington Counties used to be hotly contested with Democratic Speaker Cas Taylor hailing from Cumberland. Those days are over, as districts 1B, 1C, 2A, and 2B hold five more safe Republican seats. Unlike the other Frederick County district, District 4 is very safe Republican territory. It excludes the City of Frederick along with the southwestern portion of the County most oriented towards Washington, and can be depended up to elect three GOP delegates. Save for the sole African-American majority subdistrict, the Eastern Shore is now solidly Republican. The districts east of the Bay (35A, 36, 37B, 38A, 38B, 38C) will reliably send nine Republicans to the House of Delegates in 2018. Excluding heavily Democratic Charles County, Southern Maryland is now a great area for Republicans. Districts 27C, 29A, 29B and 29C centered on Calvert and St. Mary’s Counties are good territory for their four Republican delegates. 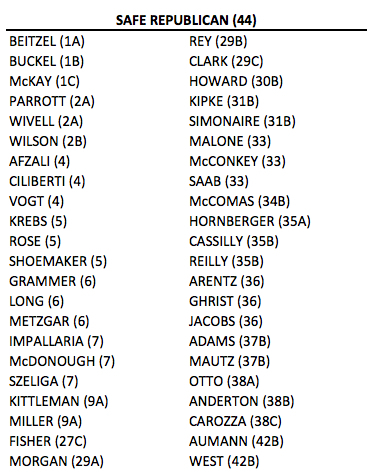 Carroll and Harford provide another trove of Republican seats with 5 (Carroll), 7 (Baltimore County and Harford), 34B (Harford), 35B (Cecil and Harford) electing nine more Republicans. District 42B, which takes in much of northern Baltimore County, has also been safe Republican turf for two more delegates. Dundalk District 6 in Baltimore County is relatively new to electing Republicans. Before 2014, it sent three Democrats to the House of Delegates. Now, Republicans seem well ensconced in this working class white district at all level of government. Anne Arundel is a hotly divided county in many elections, such as the 2016 presidential and the 2012 referendum on marriage equality. However, several of its districts tilt heavily Republican–30B, 31B, 33–and will safely elect six Republicans in 2018. As a whole, Howard tends to list increasingly Democratic. But District 9A, located in the more Republican western part of Howard with a bit of very Republican Carroll County added in for good measure, reliably elects two Republican delegates.